Even though I was born on Super Bowl Sunday and my husband played college ball, I'm not a football fan. But I do get into watching the expensive commercials and settling in for some tasty snacks. The problem is that most of what gets served for the occasion is what I call "caveman food"—stuff that you can pick up with your hands and that has enough calories to keep you going till you kill the next saber-toothed tiger. I'm all for party food, but it doesn't have to be laden with fat and sodium to be a good time. Here's my menu for game day, guaranteed to allow you to get off the couch by the halftime show. No Super Bowl party would be complete without some cold brews. If you happen to live on the West Coast, pick up some of New Belgium's Sunshine Wheat Beer. My other fave (not that I can enjoy it right now, being eight months preggers) is Blue Moon. Try the seasonal Full Moon Winter Ale. I find that wheat beer is really refreshing and goes well with a lot of different types of food. 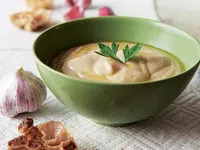 White Bean and Roasted Garlic Dip is low fat but robust enough to feel appropriate for the occasion. Serve it up with toasted pita chips and an assortment of veggies (carrots, celery, radishes, and pepper strips are nice). For something even easier, try this Creamy Salsa Dip. Just dump bottled salsa (as hot as you like) into a bowl and mix with yogurt, sour cream, and a little green onion and cumin. It's perfect for crowds that turn up their noses at anything that smacks of "gourmet." Serve with baked tortilla chips and jicama sticks. Everyone loves a Warm Spinach-Artichoke Dip, but most are filled with copious amounts of artery-clogging saturated fat. Our version uses a secret ingredient—lima beans—to keep the dip rich and creamy, while keeping the fat under 5 grams per serving. Serve it hot from the oven with crusty bread, or spoon it into a pumpernickel round. The game starts at dinnertime (6 p.m. EST), so you'll be able to stave off your guests' hunger with chips and dip for only so long. Then they'll want something more substantial, like our Stromboli and ALT sandwiches. The stromboli is like a classic meatball sub. I recommend serving it on a baguette instead of individual French rolls. That way, you can slice a big sandwich into a bunch of minis, which is much easier for serving. The ALT (Avocado, Lettuce, and Tomato) Sandwich will make your vegetarian friends happy (yes, there are non-meat-eating football fans). I would double the recipe and put turkey bacon on half of the sandwiches for even greater crowd appeal. A warm bowl of chili is another favorite game-day dish. Try this easy vegetarian Black Bean Chili With Winter Squash or our more stick-to-your-ribs Smoky Chipotle Chili with steak. It has a hint of unsweetened cocoa for a richer flavor. Make them the day before, and then serve in a slow cooker on low. Whether you're a die-hard Steelers fan or a dedicated Cardinals supporter, wrap up the game with a treat that'll please both camps. These Cheesecake Brownies have a luscious swirl on top and are a lean 140 calories. If you don't have time to make your own brownies, you can use a boxed mix and dress it up with the light cream cheese swirl. And, not to toot my own horn, but my recipe for Oatmeal-Date-Chocolate Cookies rocks. The dates add chewiness to these delicious and heart-healthy snacks. I won't tell anyone there are dates in the cookies if you don't.